Fifths (across strings) are often a significant source of problems for cellists. On the violin and viola, one fingertip can cover (stop) two strings at the same time and thus fifths across two strings can be played very easily. On the cello however, the fingertips are too small to stop two strings at the same time. This means that in order to stop two strings at the same time with the same finger we need to change our finger-and-hand posture, flattening the finger completely and pressing the entire last phalanx horizontally across the two strings. For all of the fingers apart from the thumb, this position is only really practical in the Neck Region of the fingerboard. 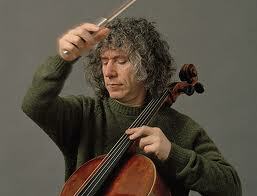 To complicate matters, fifths on the cello are often surprisingly unparallel. Science would suppose that, if the strings are tuned accurately, then the parallel fifths should be exactly at the same distance for each string from the “nut” at the top of the fingerboard (the scroll end). Surprisingly this is not so. The hand has to twist and turn in order to find the correct angle for the finger that is stopping a fifth in order for the fifth to sound in tune. What’s more, this angle changes between the different string pairs, and not just by small differences. Whereas for fifths across the A and D strings the “in-tune-fifth-angle” tends to be with the fingertip pointing towards the scroll, on the D and G strings this correct angle seems to be be pointing in the opposite direction. And on the G and C strings it would appear again to require the same angle as for the top two strings. The finger angle necessary to play an in-tune fifth across the two top strings and across the two bottom strings could be justified by the difference in “hardness” between the parts of the finger (or thumb) that are stopping the two strings. That part of the finger that is stopping the higher string finger is usually much softer and less resistant than the end of the finger which is stopping the lower string. This means that the higher string is often not sufficiently firmly stopped to sound “true” and may tend to sound flat. This can explain those fifths for which the finger needs to point “backwards” (towards the scroll). But what about fifths across the D and G strings, for which the hand needs to point the other way? There must be a good explanation for this, but I haven’t yet heard it. This is so bizarre that it resembles the bending of space, time and gravity that Einstein discovered. Perhaps he could have explained the reasons for these “crooked fifths”, I certainly can’t! In Thumbposition, the angle of the thumb required for an in-tune fifth across the A and D strings poses serious problems for our hand’s ergonomy. If the tip of the thumb could be pointing the other way (towards the bridge instead of towards the scroll) then this would constitute a help for our hand. With the thumb pointing towards the scroll however, the fingers (especially the lower ones and especially on the higher string) are obliged to curl up into an even more uncomfortable posture, which supposes a great hindrance to all aspects of our left hand technique. With the great majority of our thumbposition playing ocurring on our top two strings, this “unergonomic” fifth angle across those two strings seems like a very unfortunate act of destiny/nature/physics. If our fifth is not actually a doublestop then we can of course sometimes eliminate all these difficulties by shifting the interval on the same string or, in the higher regions, by stretching it (especially from/to the thumb. In this article however we will be looking specifically and uniquely at the techniques of playing fifths “across the strings”. Let’s look now at the five (I promise this is a pure coincidence) different ways in which we can choreograph fifths across the strings in such a way as to make them both musically satisfying and technically easy. Unlike violinists, we cellists can’t stop two strings simultaneously with one fingertip. In order to stop two strings at the same time with the same finger we need to change our finger-and-hand posture, flattening the finger completely and pressing the entire last phalanx (the entire finger pad), rigid and straightened out like a bar (or like a piece of wood), across both strings, like a guitar “capo”. This is why we will call this technique the “capo” fifth. Apart from being necessary for double stopped and slurred fifths, the “capo” fifth is also useful for fast playing even when the two notes of the fifth are not slurred or doublestopped because it allows us to play the two notes of the fifth successively without any new left hand movement (finger articulation). This of course requires advance preparation: when we place the finger, we will need to place it on both strings at once, as though we were playing a doublestop, even though we are only playing a single note. It may not be a double stop for the bow but it certainly is for the left hand. The bracket symbol seen in the examples below is the sign that we can use to remind ourselves that we must place the finger on the two strings simultaneously, and keep it on the two strings for as long as the bracket is maintained. This preparation is especially necessary – and especially difficult (unnatural) – when the first note of the fifth is the higher note, as in the above examples. If the first note of the fifth is the lower note, even if we forget to place the finger across both strings we may still be able to just squash the finger flat on the higher string in time for the higher note. But this possibility does not exist when we are starting from the top note of the fifth. If we forget our need for the capo fifth on that higher note and start it with our normal finger posture then there is no escape: the only way now to stop the lower note of the fifth is to lift off the finger and rearticulate it. NEED FOR GREAT FINGER PRESSURE. To be able to stop two strings at once with the same finger requires lots of hand pressure, especially on the higher string of the two because that higher string is being stopped with the soft, mushy part of the finger (near the joint). Because of this, cellists with big strong hands and fingers find it easier to do these “capo fifths” than cellists with small, fine hands. How often do we see a cellists with gigantic bearpaws trying to show a matchstick-fingered cellist how to play a fifth on the fourth finger. This is like trying to show a small person how to do a slam-dunk in basketball: it just isn’t practical, and no amount of “technique” or practice will ever make it any easier (see Hand Size). The first (index) finger is usually the strongest finger, so even the very smallest hand can probably do a good fifth in the lower positions with this finger across two strings (just like for the guitar). But the further away we go from the index finger, the weaker the fingers become. Fifths on the fourth finger can become quite difficult – especially in double stops or singing legato passages. This increasing difficulty of playing fifths as we go from the first finger towards the fourth finger is not only because of the diminishing strength of the individual fingers, but also because of their decreasing perpendicularity to the fingerboard. The higher fingers are not just less strong, they are also less perpendicular (square) to the fingerboard which is a shame because in order to play a fifth in tune our “capo” finger needs to be at a right angle to the strings. These higher fingers, rather than being “square” to the fingerboard are increasingly angled “backwards”, with the fingertips pointing more towards the bridge. We mentioned above how the softness of that part of the finger that is in contact with the higher string of the fifth requires extra pressure in order to effectively stop the string. Because of this softness, the effective finger pressure applied onto the higher string is often less than the finger pressure on the lower string. This means that the top note of the fifth often will sound a bit flat even when the stopping finger is at a “perfect” right angle to the string. And this means …….. that we often will need to angle the hand and finger not just at a perfect 90º to the string but past perpendicular – in the anti natural direction in which the fingertips are pointing more towards the cello scroll. The difficulty of getting the fingers perpendicular to the fingerboard and at the same time applying sufficient finger pressure is what makes this “capo” technique suddenly increasingly difficult (if not impossible) as we go up above the Neck Region into the higher (Intermediate and Thumb) fingerboard regions. Strong fingered cellists can overcome this problem thanks to their strength and may play the following passage from the Saint Saens concerto using “capo” (one-finger) fifths, but cellists with smaller hands may find alternative fingerings easier (see the same example refingered further down). The thumb is the the ideal finger for doing “capo” fifths for two reasons. the part of it that stops the strings is of equal “hardness” for both strings (assuming of course that we have a good callous). Note that if we don’t have a good callous on the side of the thumb, then the top note of the fifth (the higher string) will require greater thumb pressure in order to be stopped cleanly and thus not sound flat (below pitch). This adds unnecessary tension, effort and difficulty to our playing. To avoid that, we will need to keep a good callous by using the thumb regularly. This is a finger substitution to the adjacent string. Here the whole hand and arm actually actually changes position by a semitone, tone or minor third and the “old” finger is released during the shift to the new string. Here, we twist the left hand, turning it so the fingertips are now pointing towards the bridge (see photo). This allows us to play fifths with two different adjacent fingers. It also allows us to do a real vibrato on the fifth, which is especially important in slow double stops and chords. Because of the form (anatomy) of the hand and arm this twisted posture is only practical when we place the higher finger on the higher string and the lower finger on the lower string (and not vice versa). The “squeeze fifth” is actually a “Contraction” to the neighbouring string”. Sometimes this contraction is followed immediately by the relaxation of the hand into the new position (one semitone away from the old position). At other times the “old” finger is maintained stopped and the hand remains in the same “position” (there is no shift). The smaller the hand and fingers, the more we will tend to use this technique. This is not only because it requires less brute force but also because small fingers actually fit “across” the fingerboard whereas big wide “sausage” fingers don’t. Therefore, cellists with small fingers may find it easier to use the “2-finger-squeeze” for fifths in which cellists with large fingers may be quite happy to use just the one finger, squashed flat across the two strings. In some passages in double stops however, even the biggest, strongest hands are no solution and this “contortion” is really the only solution (see the following examples taken from the cello repertoire). If we take these same passages and transpose them up into the Intermediate or Thumb Regions, we can see that we can use exactly the same “squeezed fifth” technique in the higher regions of the fingerboard. In some passages several of the different “fifths techniques” will be used consecutively according to the musical and technical constraints. In the original Saint Saens example we are using both “thumb-stopped-fifths” and “finger-squeezed-fifths”. Here below is an exercise for squeeze-fifths in Thumb Position. Click here for a compilation of thumb position repertoire excerpts in which we use this same “squeeze-fifth” technique.